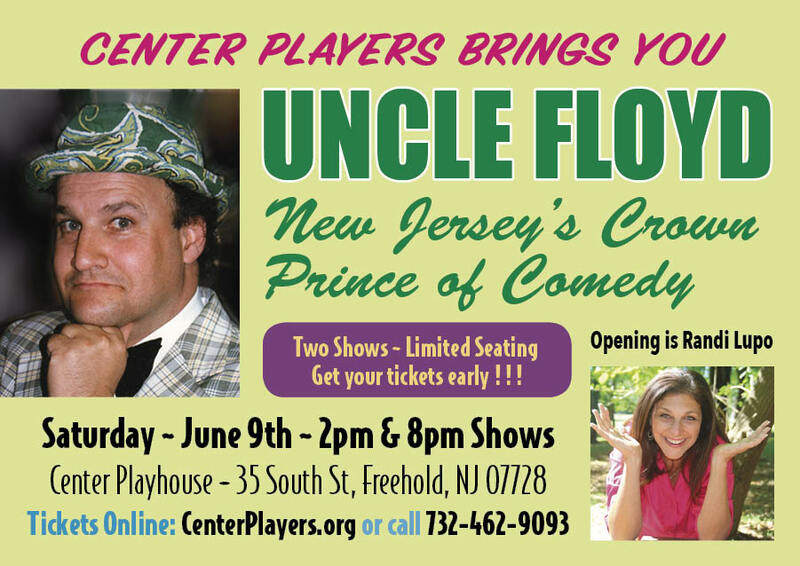 New Jersey’s crown prince of comedy brings his unique brand of comedy to Freehold’s premiere theatrical venue, Center Players in Freehold, New Jersey. Uncle Floyd is best known for his television show “The Uncle Floyd Show” which became a cult favorite of David Bowie who wrote the song “Slip Away” as a tribute to the show. Bowie heard of the show through John Lennon. Uncle Floyd has appeared in numerous television shows as well as movies throughout his illustrious career. This will be an age appropriate show (18 and above) with Uncle Floyd singing classic songs from his unique songbook and delighting the crowd with his musings. Opening for Uncle Floyd is Manalapan’s very own Randi Lupo who performs at comedy clubs in New York and New Jersey Her one woman show, “Sometimes I’m Ok” is currently being presented to sold out crowds.